Size; (160+ x c.230 m) 9 acres (3.6 ha). Discovered only recently by air survey and geophysics, this camp lies on the alluvial plain of the River Swale, on the south bank of the river just north east of Catterick racecourse. The camp lies some 350m to the west of Dere Street. Only the north east corner angle, a length of the north rampart and a longer section of the eastern defences have been recorded. There is a gateway with a possible external titulum located about mid-way along the northern side, other than this the camp is poorly defined and not easy to interpret. 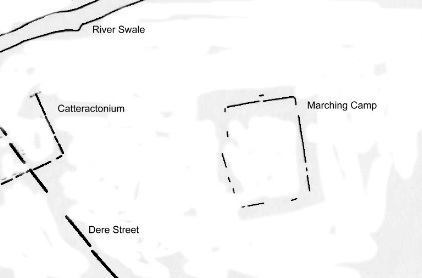 Other possible related earthworks covering a possible south west corner have also been identified.